For more than 10,000-years (over 600 generations,) the original inhabitants of the region were known as the Kumeyaay people. Other native people there are known as the La Jolla. Later, the Mission Basilica Saint Didacus of Alcalá, on a site known as ‘Kosoi’ overlooking a bay, was the first Franciscan mission there (also the first in the broader region.) It was founded in 1769 by Spanish missionary Fray Junípero Serra. It was not always successful and occasionally met with opposition from the native people. The site of the town was by no means favorable for a seaport town. The military site (known as the Presidio) was located on the hill above the river, at the outlet of Mission Valley, merely because the place could be easily fortified and defended. The town grew up upon the flat below Presidio Hill, because it was originally only an overflow from the garrison itself. From 1830 onward, the town grew rapidly and was soon, for the time and country, an important commercial and social center. The shipping trade to the Coast and to Hawaiʻi was almost exclusively in the hands of Boston firms from its beginnings to the days of the Gold Rush. Davis’ grandmother on his mother’s side was a native of Hawaiʻi, and her husband, Oliver Holmes, in addition to his trading operations, was at one time Governor of Oʻahu. Davis’ nickname “Kanaka” refers to his Hawaiian birth and blood; he was one-quarter Hawaiian. He first visited California as a boy in 1831, then again in 1833 and 1838. The last time he joined his uncle as a store clerk in Monterey and Yerba Buena (now San Francisco). He started a business in San Francisco and became a prominent merchant and ship owner. For many years, he was one of the most prominent merchants in San Francisco, and engaged in some of the largest trading ventures on the coast. He moved to southern California in 1850, around the same time California became part of the United States. In March 1850, Davis purchased 160-acres of land and, with four partners, laid out a new city (near what is now the foot of Market Street.) He built the first wharf there in 1850. The town took the name of the surrounding Mission Basilica Saint Didacus of Alcalá (the “Mother of the Alta California Missions”) – today, we call it San Diego. Whenever a ship came to anchor, saddle-horses were at once dispatched from the Presidio to bring up the Captain and supercargo. Monterey being at that time the seat of government of California, and the port of entry of the department, all vessels were compelled to enter that port first. After paying the necessary duties, they were allowed to trade at any of the towns along the coast, as far south as Lower California. Davis was one of the founders of “New Town” San Diego in 1850, though he did not live there for long (and the venture turned into a failure.) He believed that a town closer to the waterfront in San Diego would attract a thriving trade. For more than a hundred years Old Town was San Diego. It began with the founding of the fort and mission in 1769; it ended, as a place of real consequence, with the fire of April, 1872, which destroyed most of the business part of the town. 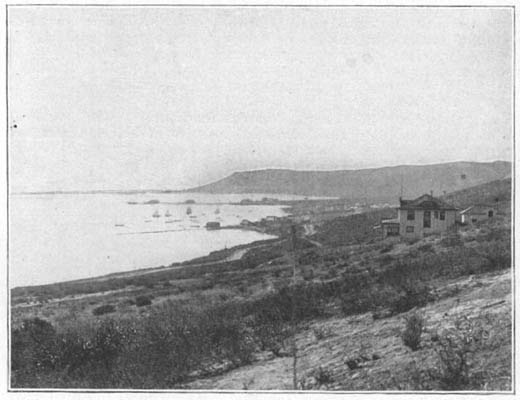 The image shows Point Loma and the Silver Gate, San Diego (San Diego History Center.) In addition, I have added other images in a folder of like name in the Photos section on my Facebook and Google+ pages.